While I would LOVE to write a series of “holiday gift guide” posts for the whole family, I honestly don’t feel qualified to do so — I wouldn’t even know where to start. I don’t have much experience buying gifts for tweens or teens… and in my opinion, babies under 2 really can’t comprehend gifts. I usually just wrap a couple small items so they can have fun pulling the paper off. Sometimes, I even wrap items they already have just to give them the “gift opening” experience! So, as you can see, I wouldn’t really have much to offer in a holiday gift guide post… EXCEPT when it comes to children ages 2-6. I think this is one of the most fun age groups for gift-giving — they are young enough that they still get so excited seeing all the gifts piled under the tree, they love the suspense of waiting to open their gifts, they eagerly tear open the wrapping, and they appreciate the gift even if it isn’t exactly what they asked for. So, since I actually have some experience giving gifts to our own kids and our nephews, I figured I’d share the gifts we’re giving Nora for Christmas this year (and a few of Simon’s gifts). 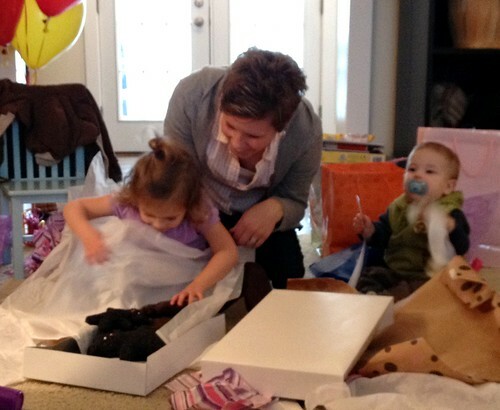 I’ll also share some of my tips and suggestions for gift-giving for small children. 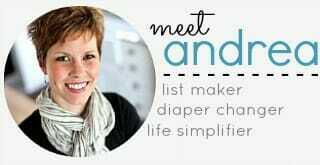 First things first, while I am a HUGE advocate for giving children clutter-free gifts, I don’t always follow my clutter-free “rule” when it comes to this age group. I have plenty of clutter-free gift ideas for this age range (read more of those ideas here); however, I think it’s also important to give tangible gifts that they can unwrap, play with, learn from, and enjoy. That said, I’ve listed out everything we’re giving Nora and Simon for Christmas below… along with a few of my favorite gift ideas for kids ages 2-6. Nora LOVES to read (she takes after her daddy) and despite her “go-go-go” personality, she can sit still and listen to books for hours. When she was younger, she would sometimes fall asleep to us reading her book after book after book trying to tire her out! Because of this, we make several trips to the local library and our church library every month. 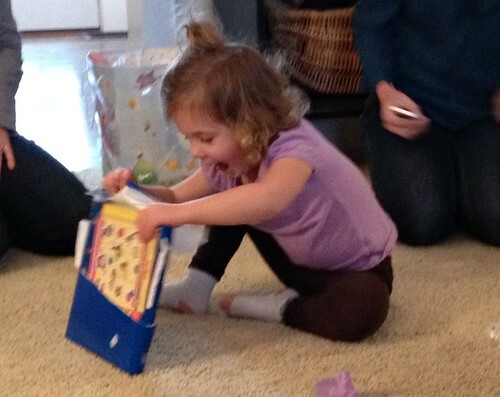 However, we also get her a few new books every birthday and Christmas. For her birthday, we got her a collection of Curious George books to go with the theme of her party… and for Christmas, we have a few more special books wrapped up for her. 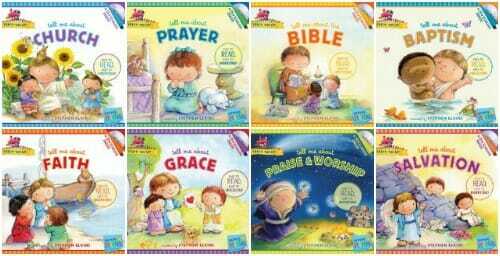 This soft cover 8-book series from Tyndal Publishers is a fabulous little collection of books that “tell us about” Church, Prayer, Bible, Baptism, Faith, Grace, Praise & Worship, and Salvation. 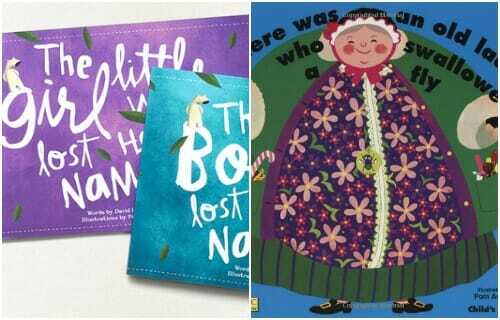 Each book is written specifically for preschool-age children and each book comes with stickers plus a CD with sing-a-long songs and narrated stories. I’m guessing many of you have never heard of the LostMy.Name books — but this is a SERIOUSLY awesome website that allows you to create a custom book for your own kids (boy or girl) with their name. The book tells the story of a boy or girl who lost their name. They set off on a journey to find it again and in the process, they meet various creatures who each give the first letter of their name. At the end of the book, all the letters spell your child’s name! Nora is HUGE HUGE HUGE on spelling and letters right now. She learned how to spell her name over the summer and now tells everyone she meets that she is “Nora… N.O.R.A.”. I can’t wait to see the look on her face when she realizes what the letters spell at the end of this book and that the girl in the book has her same name! This is one of Nora’s favorite books/songs but we don’t have our own copy of the book. My mom (an elementary school music teacher) taught Nora this song and she’s been hooked ever since. I used some of my Huggies Rewards points to get this book + CD for free. She’s going to be SOOOO excited! Nora + crafts = happiness. Besides basic coloring or water painting, she’s not to the point where she can do crafts on her own yet — but I’ll often sit at the table with her and work on my laptop while helping her with crafts. I buy almost all of Nora and Simon’s clothing used — usually from ThredUp.com. If they need something (like new pants because all theirs are too short) I don’t make them wait until their birthday or Christmas. However, I will reserve a special item or two as a gift — especially if it’s something they can easily live without for a bit. Nora had been asking for a robe, so my parents got her a robe for her birthday. For older kids who have more of a fashion preference, I think clothing makes a great gift — especially for a name brand item that might not normally be in your back-to-school budget. However, I would still HIGHLY recommend shopping used stores like ThredUp. You can find boatloads of brand name clothing in perfect condition (some even with the tags still on) for a fraction of the price — and your kids will never know! This is one area that I feel clutter-free gifts can work really well for young children. Obviously, I don’t think we should give piles of junk food to our kids, but I do think SOME food can be a really special treat. Nora got a special sucker and a bag of Smarties for her birthday and it was HUGE hit! We’ve also given her special times to go out to out to eat with either Dave or I (just to McDonald’s or Culver’s) and she thinks that is just great. I know lots of people who ALWAYS put an orange in the toe of the stockings (we don’t have stockings) and then a candy bar + other sweet treats in the leg of the stocking — I think that’s kind of a neat tradition. Nora is not getting any food from us this Christmas, but growing up, I often got gum, candy, and other edible treats in my stocking and always thought those were fun gifts. When I think of games for 2-6 year olds, it’s usually board games, card games, legos, building blocks, and other non-video games. However, I know there are tons of valuable video games that are educational and/or encourage movement and improved motor skills. 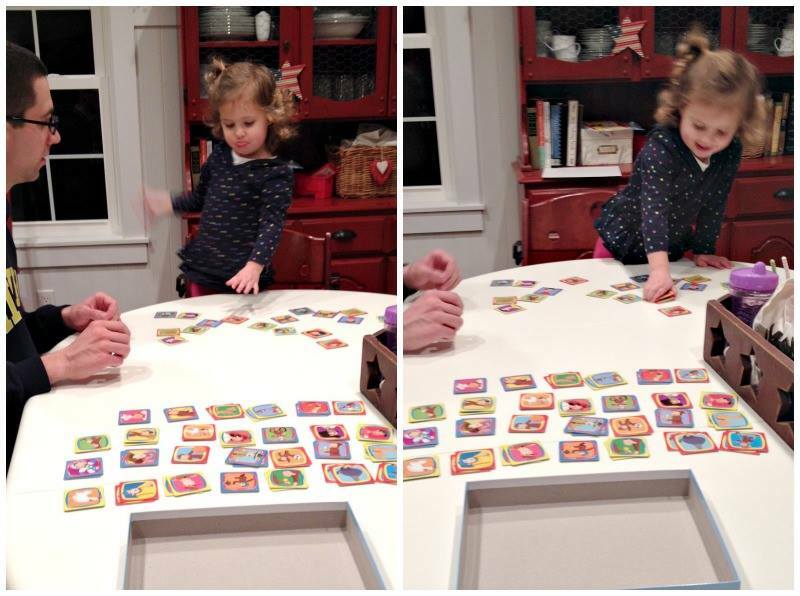 Nora is just starting to enjoy simple games — and kind of understanding how to play a game. Matching games are her favorite so she got a Curious George matching game for her birthday and I think my parents might be giving her another game for Christmas but I’m not sure. Yes, toys… I’m encouraging you to give your kiddos toys! I honestly have nothing against toys — as long as you have somewhere to store them and as long as they actually get used occasionally. We just did a little purge of Nora’s toys to make room for the gifts we knew she would get for her birthday and Christmas. She got a few hand-made stuffed animals from Dave’s parents as well as dress-up clothes from my sister and a Burley MyKicks Balance Bike from us for her birthday (although that’s in the garage now). For Christmas, I found a child’s cash register (with working buttons, scanner, cash drawer, microphone, etc.) on Craigslist for $5 last week. One of Nora’s favorite things to play is “grocery store” so I know she’ll love this gift — and no, I don’t think it’s weird to give a used gift. Nora and I found a couple Fisher Price toys from Kohl’s for Simon ($2.12 total thanks to coupons and sales). I also got one toy for him at a local thrift store for $0.50 and I used my Pamper’s Rewards to get a free pop-up “tunnel” that we’ll be giving to both Simon and Nora. I was sent a few of the Yondi children’s travel neck pillows form Trunki.com and I thought they would be a really fun Christmas gift for the kiddos — especially since we’ll be doing a bit of traveling in the coming months and these might be nice for longer car and airplane trips. I know there are SOOOO many other categories and gift items I could talk about, but like I said earlier, I don’t feel super qualified to promote various toys and products that I haven’t personally used. 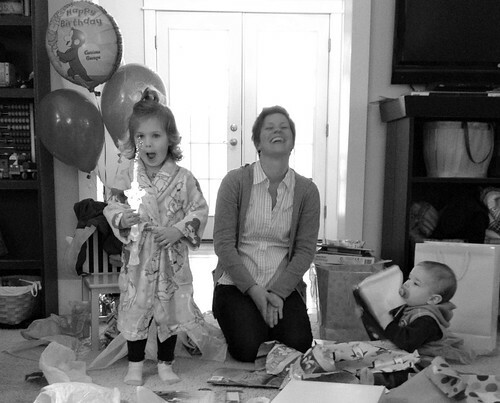 In general, I think Dave and I want our kids to realize the true meaning of Christmas (totally NOT the gifts) but still be able to enjoy a fun time of anxiously anticipating opening a few special gifts — especially when they are so young. If you’re looking for a great gift idea for a 2-6 year old, I’d heartily recommend any of the ideas in this post… however, I’d also love to hear what you’re giving your tots this Christmas. I’ll save them as ideas for next year! And thanks for the awesome idea — I never considered giving this book to new parents with the baby’s name. Genious! Love your simple ideas for gifts! My boys are 1 and 3 and we’re sticking with simple too. We’re doing home-made super hero capes. Excited to give the HAPE wooden toaster, and some actions figures from Goodwill (found a bag of 20 for $5, way more than we need so we’ll share them around the nieghbourhood kids too). Unrelated question Andrea – any thoughts on getting rid of breakable ornaments? I have a tote of around 120 from when we were 1st married, in our wedding colours, but they have not been out since we’ve had the kids, for safety reasons. Can’t decide whether to just get rid of them or hold onto them…. Our house is small, we don’t have room for a big tree any more, we have hardwood floor and little kids who would knock over a big tree if we did allocate their playspace to a tree. I think I want to get rid of them but I asked on facebook and EVERYONE said to keep them! Hi Nicola — you asked the right person if you’re leaning towards purging! I would definitely encourage you to purge the ornaments… I mean you haven’t even looked at them in years, and it’s not like they are ornaments given to you by your grandparents when you were a little girl. They aren’t THAT sentimental… right? I’d say if you’re leaning that way, purge now. That way, someone else can buy them and use them this year! Thanks Andrea – that’s just the permission I needed! I guess my facebook friends are more sentimental than me! Nicola, perhaps you could take a picture of them and then donate? This post was right on time. I’ve been searching for gifts for my friend’s children. The lostmy.name book is perfect. Thanks for sharing. 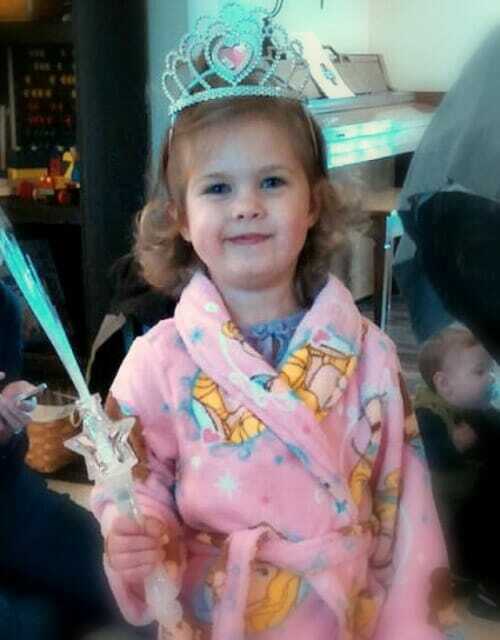 Nora looks so much like you in the picture with the robe and the tiara!!! Unbelievable! My 2 nieces (ages 8 and 4.5) are in love with Frozen, so I’m making dresses for them (only about 50% complete right now – better speed up!.) I found cute trunks (Frozen themed) at Ross and I’ll put each dress inside, along with an invitation to a “Frozen” Party/Sleep over at my house sometime in January (I’ll have to arrange the date with their parents). For the 2 nephews (9 and 6) that love to hang together all the time, I’ll buy pajamas. I wanted to sew them myself, but I’m going to run out of time and I didn’t even purchase the fabric, yet. I hope to find something with a “nature” design, in particular: worms, slugs, insects. They call themselves “Nature Hunters” and love to come over at my house and dig, poke and wonder over anything that moves, or any signs of life. Again, I’ll include an invitation to a “Creepy crawlers sleep over” party. I’ll put the pajamas along with some “tools” (for digging and storing their finds, notepads and pen) in trunks/treasure chests I found at Ross. I’ll encourage them to keep these trunks at my house so they’ll be ready for adventures. 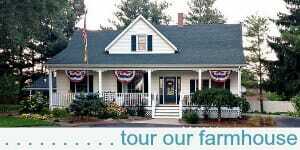 (We live more “out in the country” than they do and the house has a cabin feel to it. I know they all want to come for sleep overs as often as possible! And we have lots of fun when they do! I’ll get a set of clothes, pj’s, underwear, toiletries for each of them. There’s no more clutter added to their homes, and we’ll be enjoying this throughout the year(s). wow — you win “aunt of the year” award for sure! 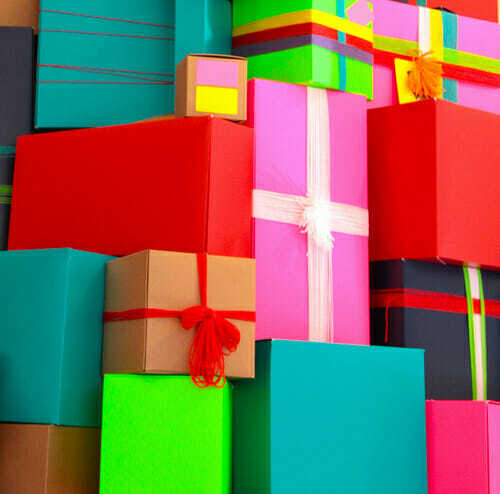 Your gifts are the perfect combo of “just what they wanted”, a unique creation they’d never be able to buy, and clutter-free. Perfect! As always, loving your suggestions! And yes, 2 to 6 are the best and magical ages to give! When my little one was 3 he asked for wrapping paper, ribbon and tape. And that was what he gets! Some people thought that we was cheap but at the end of the day he was happy with their gifts. Happy holidays for all your family! We’re keeping it simple for Nathan this Christmas as well. As an early childhood educator (who stays at home now), I think your ideas are great! I’d add some books with cds so that children can “read” on their own. I also think there are some great Bible scripture cds (Hide ’em In Your Heart, as one) that children can start enjoying and learning from an early age. And yes, books, books and more books, are always a great idea to go along with the toys! 🙂 When in doubt, we’ve told relatives that if they want to simple contribute to Nathan’s college fund, they can do that – as the ultimate clutter free and practical gift. The tunnel was the best gift ever, and I also agree it is a great gift to GIVE little kids. Ours has been passed down through 4 kids and it easily stores away under our couch. I also love the recommendation of crafts and books- the books can be donated after the kids outgrow them too, helping to declutter the toys- an endless job! thank u so much for your great gift ideas for ages 2-6.
haha — no worries! For starters, we don’t have a chimney, fireplace, or any other logical place to hang them without kids CONSTANTLY pulling them down. Also, I feel like stocking are usually just stuffed with cluttery stuff that no one wants or needs (besides the candy!). I’m not saying we’ll never do stockings, just not right now. We have a tradition of doing stockings as a tradition. We only put them out on Christmas Eve (family of 6, stockings take up a lot of room otherwise). – older ones get: deodorant, toothbrush/toothpaste, razor blades for shaving, 1 piece of candy. I guess our Santa wants to make sure we have good teeth and smell good! lol! haha — love this! I think, growing up, we always opened our stockings on Christmas Eve and that was a fun tradition. I’ve put a toothbrush (the fancier more expensive kind), toothpaste, gum, a little candy (not a lot just some to make it a treat to eat it right away if they want to), bouncy ball, jax, card game, tattoos, slinky(they loved them when they were little but they don’t last forever so for awhile they got a new one every year) – strangely, the like getting funky toothbrushes so that has continued as the have gotten older. And, the candy and gum. I try to keep it simple but it gives them something to dig through while Mom and Dad are getting that first cup of coffee! I appreciate the gift recaps of what Nora (and now Simon!) receives, as my nephews are just a couple months older than your kids. My nephews have SO many toys. They were also born around the same time of year, so my younger nephew doesn’t need much in the way of clothes. It’s a struggle because we want to give something the boys can be excited about but that isn’t going to just sit in a pile of stuff. For my nephew’s third birthday I took your advice and went clutter free. I found a silicone molds of some of his favorite characters and made him his own special chocolates. For Christmas, I’m using the mold again to melt down crayons, so he can have fun shaped ones. The crayons, along with paper and stickers, should keep him entertained! My older nephew also enjoys puzzles. It’s hard with the younger one crawling, so I buy ones with larger pieces for when they inevitably end up in someone’s mouth! In just a couple months, he has gone from “helping” me put together a puzzle to doing ones all on his own. Is there a deal on the “Tell me about” books? The link is showing them at $5 each and if you only spent $30 total for all of your gifts for the kids, there must be a bargain I should check out/watch for somewhere? Thanks! 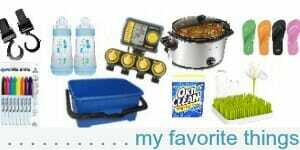 I got most of these gifts many weeks and months ago — and I did have freebie coupon codes for many of the items based on different reward and affiliate programs I’m a part of. So yes, I got the Tell Me About books for free 🙂 However, I’m pretty impressed with them — and the extra stickers + sing-along CD’s really are the icing on the cake as far as I’m concerned! My oldest sat on Santa’s lap when she was about 3 and asked for tape — it was all she wanted that year! I miss those days… Now that they are older they compare notes with their friends so i’ve noticed their Christmas lists are growing, both in size and expense. haha — Nora would LOVE it if I gave her her “bery own tape” because she wants to use my tape all the time (but she just pulls it all out and wastes it). My favorite gift for babies who are around 9-12 months: wrap a package of baby wipes (not the refills but the ones with the opening to pull out the wipes) along with a ziplock bag. Each of my boys got this for their first Christmas (at 10 and 11m) and delighted in pulling every wipe out. Then I just stuck the wipes in the Baggie to use later. Practical, cheap, and fun! Great ideas – thanks for sharing! Our big kids (10 and 6) are each getting an extra special date night (monster truck rally with dad for 6 year old), community theater musical/ dinner out with mom for 10 year old). All the kids are getting books/activity books. My toddler is getting a homemade ABC photo book as her “big” gift (thanks for the idea!!!!). My 6 year old loves Legos and sports. He may be getting (from other family members) batting gloves, a new baseball glove, nerf stuff and/or of course Legos. I’m also a huge fan of buying used toys as gifts! Especially for younger kids! Oh – and my kids each always get a new ornament every year in their stocking! I LOVE the date night idea Bekah! Thanks for sharing!